-We start and end our day with family readings (which is my most fave part of the day). Viking Tales (copyright 1902!) have my littles hollering "A viking we will go!" - I made a really good lunch that included my own broccoli and my own greens. - Aside from two couples who walked by, we had the beach to ourselves this afternoon. - I caught my big two trying to shield the eggs from rain with an umbrella. - I haven't had to water my garden, mother nature has been taking care of that. - I love watching my baby girl with her daddy, I love watching her sleep, watching her talk. I love her so. - I have 6 loaves of fresh bread sitting on my counter that we will definitely be diving into tomorrow. The first week of July is going to be great, I just know it! This diamond isn't far from us and I cannot believe we had never been. We got to attend school in the school house, print in the print shop, do old fashioned laundry, some old fashioned cooking, grind some grain, power the horse treadmill, watch a blacksmith do awesome things, ride the 2nd oldest working wooden carousel in the world and learn about simple machines. It was truly an awesome day. We could have been there double the time! It's after midnight and all three in this pic have been a big part of my last hour. Skunk strikes again. Skunk 3. Jackie 0. Not winning. Not in the least. Especially since the last time I set the havaheart trap I caught each of our cats on different days. Definitely not winning. This little girl is wide awake to talk about it, at least she keeps me company. Somehow it happened that those potato bugs just crept up, out of nowhere, seemingly. I swear I was *just* out there and things looked mostly good. Sure, I picked a couple of potato bugs off, but not enough to think twice about. Today I went out and the couple of bugs turned into oodles. Virtually no problem turned into a big problem. I admit I felt defeat. I thought I had put in the time and the work, I thought I was diligently watching out and then I was thrown for a loop. How did I miss so many!? Can't go back, can only go forward, hoping for the best. Might as well get a bucket, get a little help, make some fun out of a disappointing situation (by assigning points based on size!) and do something good with the pieces. The chickens loved the treat. This potato bug journey doubles as my parenting journey these last few days. Can't look back, can only look ahead. I'm just going to keep on keeping on and hope that there will be potato harvest eventually. Not only am I playing the grocery game and trying to stretch my trips as far as possible, but I also make PBJ a big process. Finally made some berry rhubarb jam and some bread. Sure, it took me 3 days to make a PBJ, but you can't beat a PBJ with fresh jam and homemade bread. Plus I just made it another day without going to the grocery store. Win! Grocery game over tomorrow as I have to go to the store to get supplies for the first of our many ice cream socials of the summer. We still have PBJ, which I have a feeling we'll want to eat tomorrow anyway, even after a trip to the grocery store. Yum. This is the weather we end up at the beach almost daily for a quick dip. Mostly we go in the late afternoon/early evening, when the beaches are nearly empty. Nothing like the frigid waters to make these hot/humid temps more tolerable. Thankful we only live 6-7 miles to the ocean. I leave the van packed so we can scoot over at almost a moment's notice. We tend to stay just an hour or so. I rarely bring my camera and I do not have a cell phone to take pics (this pic is actually from last year), but if I did bring my camera, I'd have oodles of pics from the fun we have. This season marks a whole new dimension. Today I had Anna-Kate napping on my chest while I actually read a magazine (the entire thing in one sitting! ), so relaxing. I love snuggling my little girl. When she woke up, I put her little toes in the cold waters and she smiled and loved it. This one woman looked at me and said "You look like you have it all together." Certainly, throughout the day there are moments I feel utterly scattered, frustrated and exhausted. But, at the beach, all is well. Thankful for Maine Coastal Living. Oh, this duo...tugging at my heart strings. I think that tortillas definitely taste better when made by a cowboy. Especially a cowboy with dimples. The longest day of the year. I remember Summer Solstices when I was a kid, staying up late, reading in bed well past my bedtime. It was a gorgeous evening here. Big two running around in their underwear looking for ripe strawberries. I was nursing a fussy baby while weeding the carrots. 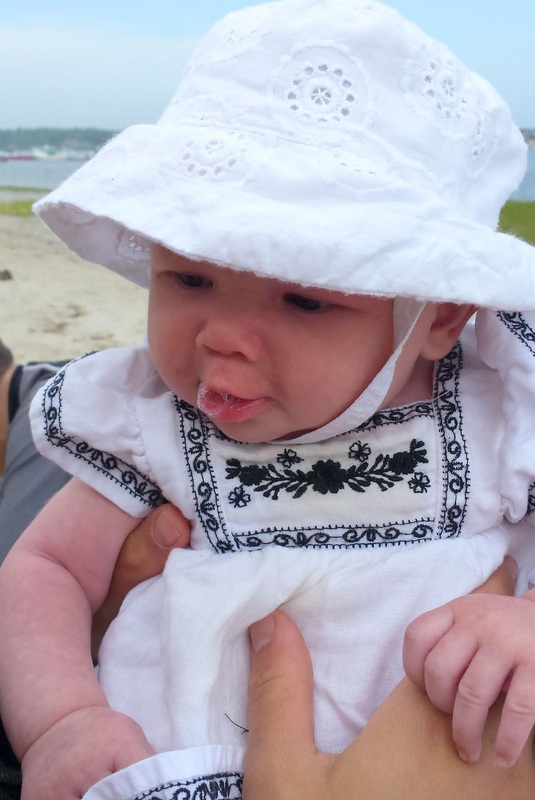 Sweet fussy baby calmed right down in her new to us (free!) swing. Then a James Herriot marathon book reading session. Now I'm enjoying a summer snack of crackers, cream cheese, topped with fresh homemade jam. Summer has officially begun. It's going to be a good one! Our annual trip to the zoo...with mama made tails. Somehow they always want me to be the elephant. I accidentally 'forgot' my elephant tail in the car this year. Oops. She's also sporting a mama made hat and mama made skirt. He says he's wearing mama made shorts because I cut them from pants to shorts. Seriously, can't get enough of these tails! They just went about their fun, forgetting about their tails, whereas I was smiling at those tails all day. Someone slept through most of it. Woke up at the end. It's funny how the seasons change and our rhythm follows. During the winter, we are inside during the morning and evenings and head outside midday, to catch the warmest part of the day. Now that we are almost officially into the months of summer and the weather is uncomfortably hot (for me anyway! ), we tend to spend the bookends of our day outside, with the middle part of our day inside. Thankful this old farmhouse stays pretty cool most of the summer. Inside midday unless, of course, we're at the beach. 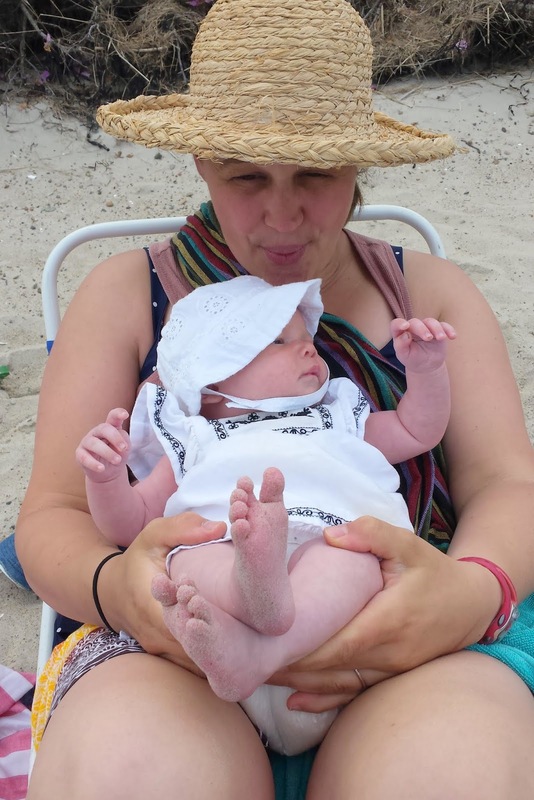 This was Anna-Kate's first beach trip and I didn't bring my camera. Oops! I coaxed my husband to walk back to car to take a couple of pics with his cell phone. He gets the credit here. 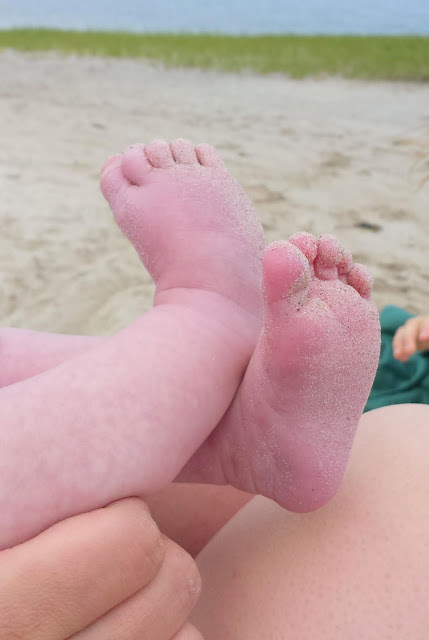 Tiny sandy toes, I love them so! Thankful during these hot days that cooling off oceanside is only 6 miles from our home. Just another reason why I'm glad we have made our home-sweet-home in Maine. June "Chicken Soup with Rice"